Virginia resident Ken Nethken, who spent an entire day knocking on the doors of embassies and government department buildings in Washington, D.C. After hearing about the Ebola epidemic in Africa over the past month, he realized he had an ambulance that was just collecting dirt and could benefit those in need. Nethken, who operates Nethken Associates in Fishersville, used the ambulance to cart supplies back and forth. 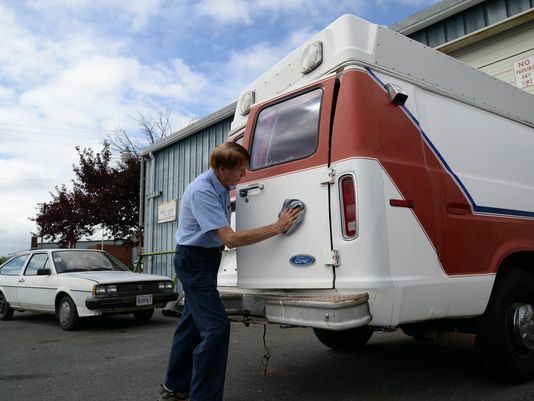 His brother purchased the vehicle 12 years ago, and it has been driven 150,000 miles. “I know the need is out there for it,” Nethken said. During his trip to the nation’s capital, he started to lose faith until he got in touch with the Liberian embassy — they wanted the ambulance. Nethken cleaned up the vehicle and changed oil ready to take it back to D.C. “I know that doing a lot of cosmetic work isn’t going to make a difference … but I want it to look respectable,” he said. The embassy will ship the the ambulance, which is expected to cost up to $3,000, Nethken said. Along with the ambulance, medical supplies, donated to the embassy, will also be sent to Liberia.